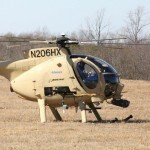 Going beyond remote-controlled technology that currently exists for aircraft, the Office of Naval Research is spearheading the development of a new rotary-wing aircraft software and sensor system that would bring autonomous approaches and landings via manned or unmanned helicopters. According to ONR, the Autonomous Aerial Cargo/Utility System (AACUS) is designed to provide, “autonomous approaches and landings at unprepared landing sites, minimally supervised by field operators with no special training,” for manned or unmanned rotary-wing aircraft. During February and March, Marine Corps Base Quantico hosted demonstrations at Range 15 for Marine Corps and Navy leaders and ONR representatives. Quantico Marines assisted in setting up equipment to present the prototypes. The AACUS program is a $98-million, five-year effort to provide this autonomous capability to the Marine Corps and Navy and has the potential to make an impact in mission accomplishment. The system is a result of the effort to develop a method, other than convoys or manned helicopters, of delivering supplies to the battlefield safely and expediently.